The spring game is here. Notre Dame fans have waited four months to get over the Cotton Bowl loss to Clemson and Saturday will provide a quick glimpse into the future of the program. There will be overreactions and hot takes during the 2.5 hours the Irish play football, which will likely lead to more overreactions and hot takes on the message boards for the next four months. My best advice to those who are watching, enjoy football in April and watch these five(ish) players. Not that you shouldn’t be paying attention to an excellent Ian Book, but Saturday will be the first chance for many Notre Dame fans to see Phil Jurkovec. The Western PA native had an up and down spring, but we saw more good moments than bad moments. In fact, Jurkovec brings an excitement to the offense as he’s going to push the ball down the field and probably a little too much at this point. The 6-foot-5, 225-pounder is going to throw quite a few deep balls on Saturday and he’s going to hit probably more than he should because Notre Dame’s receiver corps has shown they will make big plays. You will also likely see him miss a few throws he should hit, but remember, it’s his first spring and really the first time he’s been asked to throw against a live defense in front of people. 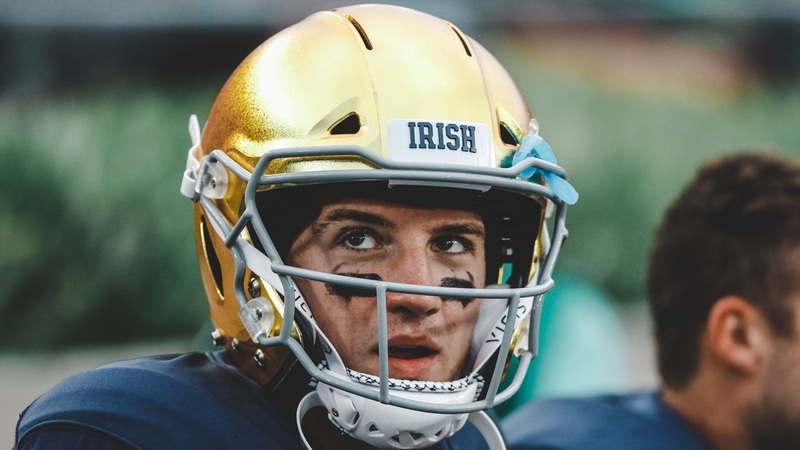 I do think Jurkovec will impress as he has always shined the brightest when the lights are on, but make no mistake, Ian Book is QB1 at Notre Dame. Saturday is an excellent opportunity for Jurkovec to get a ton of reps, get quality film and learn from his mistakes as he heads into the offseason. Speaking of excitement, you will want to keep your eyes on No. 13 on Saturday. The speedy and slippery receiver will make big plays, which is something he wanted to do last fall. This will be everyone’s first glimpse into the New Orleans native in live action and there is a good chance there will be plenty to buzz about following the game. Keys has shown the ability to beat his man this spring, but also to make plays after the catch. I’d look for him to be used in a variety of ways on Saturday – jet sweeps, screens, deep balls, crossing routes and routes to get him into space. While the Blue-Gold is far from an indication of what will happen in the fall, it’s still a chance for Keys to show off his unique skill set and how he can impact this Irish in 2019. The Georgia native really started to come on the last two weeks of spring ball and even got a ton of reps with the first team offense with Cole Kmet out with an injury. Those reps will probably be extremely valuable moving forward as Tremble can play football at a high level, but also create a nightmare for defenses when it comes to matching up. Tremble is going to be faster than any linebacker who lines up against him (minus maybe Jeremiah Owusu-Koramoah) and any safety. At 6-foot-3, 237, Tremble is also bigger than any cornerback who will face him. He’s got the speed and athleticism to get deep and win 50-50 balls, but also the hands to make sure Notre Dame moves the chains. I’d expect him to get more playing time than he wants on Saturday as I’m sure Notre Dame will be cautious with Kmet, but also because I’m sure Chip Long would love to get a ton of film of No. 24 to build on. Early enrollee defensive linemen are supposed to be behind the curve ball as they are going against grown men. Lacey has shown the ability to make plays early and often to this point in the spring. He’s been able to create pressure in the passing game while also shooting gaps in the run game. The Bowling Green (Ky.) native is far from a finished product, which should make it even more exciting for Notre Dame fans. I’d expect Lacey to make one or two big stops on Saturday, which will give him momentum and more importantly, confidence as he heads into the summer. OK, this is cheating, but you will want to keep your eyes on Asmar Bilal, Jordan Genmark Heath and Shayne Simon on Saturday. I did hear redshirt freshman linebacker Jack Lamb might have a bit of an ankle injury, so he might not be able to go on Saturday or be at 100 percent health. Lamb was consistently running with the first unit this spring, so it will be a little disappointing to see him not out there. Can Bilal make plays from Mike? Can Simon make plays from Mike? Can Genmark Heath continue to flash? There is a ton of athleticism there and I’m sure Clark Lea would love to see his guys go out and make some plays in a game setting. It will also be interesting to see where Bo Bauer and Jonathan Jones fit in. Can Bauer show up in short yardage situations? He’s better against the run than the pass at this point, so can he make a few plays to earn him a role potentially? Early enrollee running back Kyren Williams and redshirt freshman running back C’Bo Flemister could be in line for a lot of work. Tony Jones Jr. suffered a head injury last Saturday, so he might not be able to go, while redshirt freshman Jahmir Smith has been out with an injury for the last week(ish). Flemister and Williams have seen their reps go up in recent weeks due to the injuries, so they could find themselves in a situation similar to Tommy Tremble in terms of getting more playing time than expected. Both players have flashed, but both need to prove a ton. Flemister has shown the ability to get out of tight spaces and run much tougher than his frame, but can he become a home run back? Williams has shown a variety of skills this spring, however, he’s still swimming and Saturday will be a great chance to prove he can get loose, but also the fact he isn’t afraid to lower his shoulder. You can watch the Blue-Gold game at 12:30 PM ET on NBC Sports Network.